Dragonwagon, Crescent, and David McPhail. All the Awake Animals Are Almost Asleep. New York: Little, Brown, 2012. Enter All the Awake Animals are Almost Asleep. This is a lovely alternative to Goodnight Moon. Everything about this book is calming, from the soft colors of the illustrations to the sonorous alliteration of the abecedarian pages (“Fox, fading fast, finds rest in the forest”). It’s like printed soma for babies--all of the soporific effect, none of the guilt that might come with giving a baby actual sleeping pills! And it’s easy to adjust the dose to match your baby’s level of exhaustion on a given night! If baby is wound up, you can drone through every word on every page until you have rendered her quiet and compliant; if it’s one of those nights where you stayed too late after dinner at her grandparents and you’re just trying to go through the motions of her sleep routine as quickly as possible before she passes out, you can skip clauses and adjectives as necessary in order to speed her into her crib (“Fox . . . finds rest;" move on to Goose and Gander). I have personally watched my baby fall asleep while this book is read more times than any other book in her library, and if there’s one thing I know on account of having experience with exactly ONE baby, it’s that anything that reliably puts ONE baby to sleep will reliably put EVERY baby to sleep. The MOST important thing about All the Awake Animals, though, is that it is written by a woman named “Crescent Dragonwagon.” Reader, that's not even a pen name. The author’s LEGAL NAME is CRESCENT DRAGONWAGON. Dragonwagon casts this up to the foibles of youth, and notes that the number of times she’s had to explain why her name is Crescent Dragonwagon would make her think twice if she had to do it all over again. Personally, I’m glad (FOR ONCE) that time travel hasn’t been invented, and she can’t go back and tell herself not to change it. Crescent Dragonwagon is to names what all those gorgeous bohemian photo shoots in the Anthropologie catalog are to clothing: I know that I am never going to dress that way, but I really wish I were the sort of person who did dress that way so I could actually have the rich fantasy life I have developed around wearing flowy dresses to weird garden parties and swanning about on divans in a constant state of gorgeous ennui. In fact, now whenever the Anthropologie catalog comes and I page through it imagining I am all of the models I ALSO imagine that my name is CRESCENT DRAGONWAGON. Representation: the only human is a gender-ambiguous blonde, white child shown sleeping on the cover. The animals alternate between male and female pronouns. 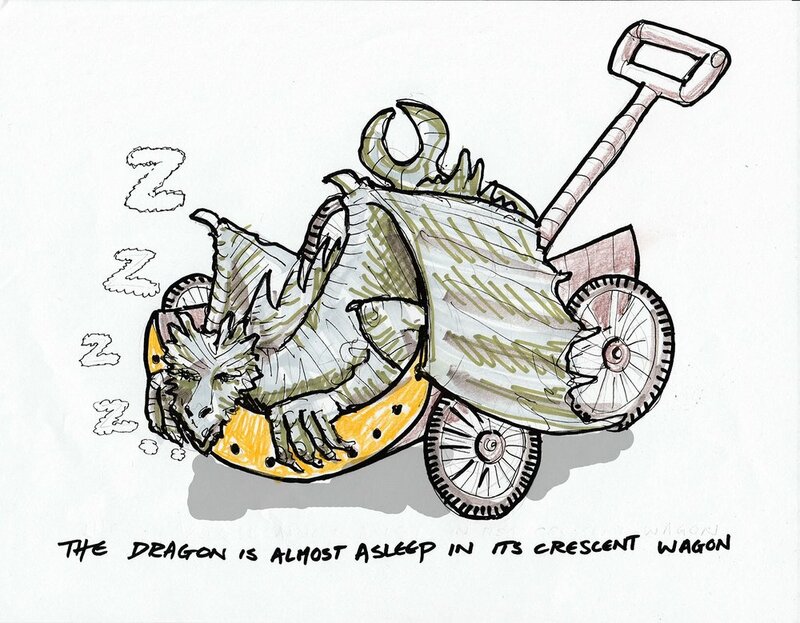 The author provides much-needed representation of people named Crescent Dragonwagon. *For the classic treatise on flawed decor in Goodnight Moon, see The Ugly Volvo.